Every healthcare student and professional starts their journey starry-eyed and keen to make a good impression on colleagues. Potential conflict with supervisors or disciplinary procedures would definitely be on the list of things to dread! So what do we do when a hospital policy is at odds with our religious identity and faith that we hold so dear? This is a dilemma almost all hijabi healthcare professionals working in a hospital environment face due to the Bare Below the Elbows (BBE) policy and lack of consistent policies on head coverings in theatre from hospital to hospital. Research published in the BMJ Open recently found that 51.5% of respondents had experienced problems wearing a headscarf in NHS theatres. Some women felt embarrassed (23.4%), anxious (37.1%) or bullied (36.5%). Of the respondents, 56.3% felt their requirement to cover their arms was not respected by their Trust. The BBE policy arguably has little evidence to prove it has reduced the spread of infection. Yet it has become part of hospital culture and enforced almost in a military manner by infection control nurses, especially when Care and Quality Commission (CQC) inspections loom! As an extension of this culture, many female healthcare professionals can be asked to remove their head coverings in theatre, even though there is no evidence to show head coverings are harmful. 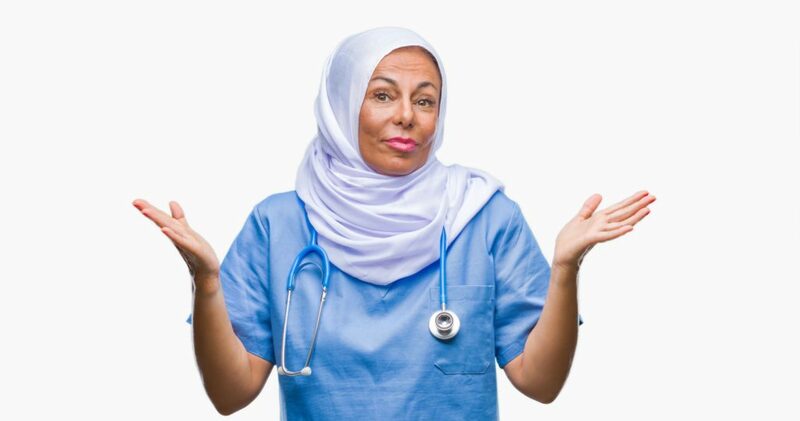 If healthcare professionals refuse to roll up their sleeves or remove their head coverings, they risk being seen as belligerent and disobedient – especially if others of the same faith have complied! Most at risk of being intimidated into compliance are the students and junior healthcare professionals new to the hospitals or theatres. Regarded as ‘the bottom of the chain’, they are less likely to speak up for themselves and may be scared to challenge policies in the same way as registrars and consultants. However, the premise of the BIMA Hijab and Bare Below Elbows (HBBE) project is that all these feelings of intimidation and harassment that Muslim female healthcare professionals experience are unnecessary, and the project exists to try to encourage a change in culture at both the policy and grassroots level. What are the solutions to the HBBE policy we advocate? • As per Appendix B of the 2010 Uniform and Workwear policy, Muslim women should be either provided with disposable oversleeves or should be allowed to keep their sleeves down when not engaged in direct patient care activities. • Muslim women should be allowed to bring in their own freshly washed hijab at 60 degrees. • Orthopaedic hoods that cover the neck fully should be made available or be purchased. 1. Share our research, published in BMJ Open. This research, which has taken 4 years to plan, conduct and write up, provides evidence that dress code policies and implementation in hospitals is a problem that needs to be taken seriously by policy makers and hospital managers. 2. If you are a student or junior healthcare professional working in hospitals, download our online toolkits that provide a step by step guide on how to proactively deal with the BBE policy and the hijab in theatre issue before you are reprimanded by ward staff! Let’s change hospital policy and culture, hospital by hospital, and make sure disposable oversleeves and suitable head coverings in theatre are readily provided and not questioned. None of our junior sisters should be forced to make career choices on the basis of feeling they have to compromise their deen if they pursue a hospital specialty. True even as a sonographer I am forced also to follow this policy. We are aware if the patient is infected perhaps we may do bare below the elbows but for routine scanning cases. Great work may allah reward you. Personally as hijabi I have to add that when you are faced with an infection control sister demanding to expose your arms and not actually give you the option of wearing disposable sleeves untill you stand firmly and say I would leave the job if you force me to BBE. So they are not being transparent at some trust about available options.